The PS5000 Series is the newest line up in the Pro-face Industrial PC family. 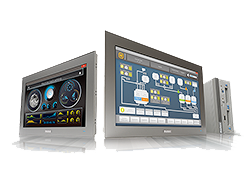 With multiple display sizes from 10" to 22", customers can choose from a slim, modular, and box design, with low reactivity glass that creates less glare and higher contrast. Available with different processors include Core i3, ATOM, Celeron, and Core i7, there is an option to fit almost any application. NEW PS5001B Atom Box units are now available! These box units will connect to any PS5000 modular display. Combine with the PS5600T 12" Display for a more powerful drop-in replacement for your current PS4600 industrial PC.